A high quality acrylic sealant specifically developed to be overpainted with water based and synthetic paints immediately after application. This product is for interior use and adheres to most surfaces perfectly without the use of a primer. This product has low odour, does not discolour, is easy to apply and not corrosive towards metals. 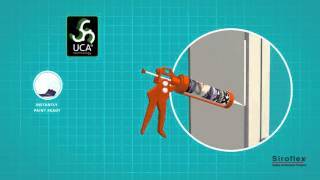 For the sealing and filling of gaps and cracks where movement can occur, such as those between plasterwork and window frames, door frames, skirting boards, windowsills and architraves. For filling cracks and screw and nail holes in walls and ceilings. Use prior to painting and wall papering to prevent unsightly cracks developing later. Has good adhesion without primer on concrete, brickwork, plaster and painted wood. Do you have a question about Instant Paintable Caulk? We would like to help.